Throughout 2015 I will be looking at Bill Mollison’s Permaculture Principles. I have allocated one principle per month at random. I will aim to find a relevant image, some quotations around the subject, some possible applications and a challenge for myself that relates to the Principle and the Permaculture activity I am involved in at that time. 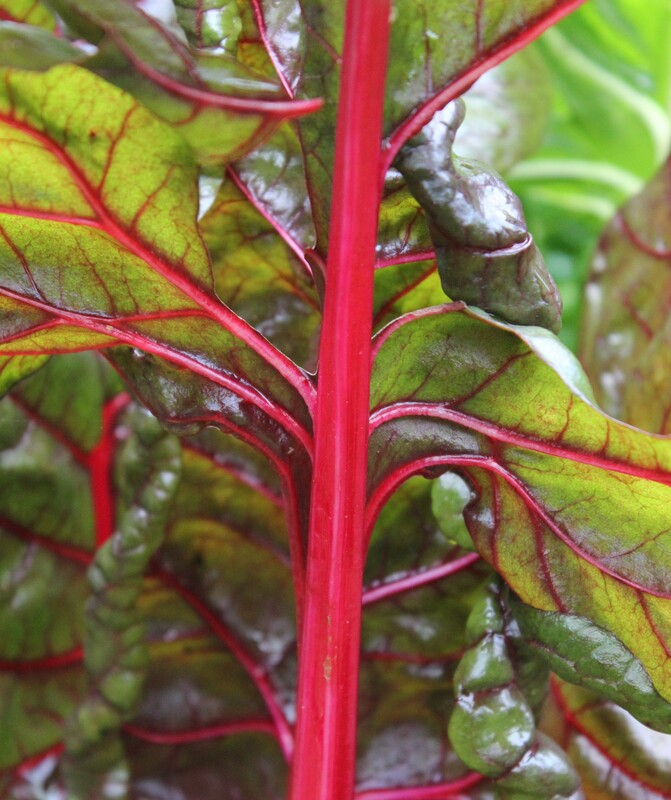 This photos shows a rainbow chard plant growing in my garden. It stays vibrant for months, the ruby-red colour shine out and draws my eye every time I walk past. I love the parallels in appearance with a tree. if you look carefully you can imagine the stem and branches. The stem is like permaculture principles, keeping us strong and nourished in all that we do. July and August. I allocated two months over the summer to look at the attitudinal principles; for example, ‘everything gardens’ ‘Yield is limited only by the imagination of the gardener’ and ‘the problem is the solution’ I confess that I skived off. I decided to take time off, concentrate only on vital tasks and enjoy time with my family. So I will return to these principles next year. September. Each element performs many functions. October. Each function is supported by many elements. I looked at these two principles together as they are like two sides of one coin. I thought about my career path and how linked or otherwise the elements of it were. I looked at the functions of my career, what it does, (makes an income and gives me fulfillment) Then I looked at the elements, all the separate activities that I do. (Studying, teaching, training etc) I draw lines to link up these areas and created this crazy scribble below! 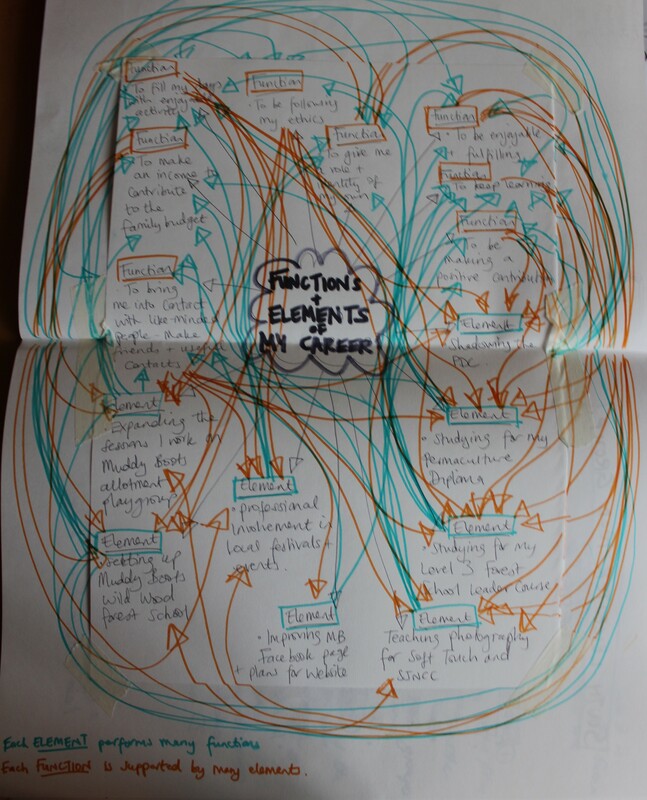 In Permaculture we call it a ‘web of connections’ I discovered that all separate elements of my career are all very interlinked. I think this gives me meaning, cohesion and resilience. Pretty good I thought! This entry was posted in Uncategorized and tagged Bill Mollison, elements, Functions ans elements, My garden design, Permaculture, Permaculture design, Permaculture Diploma, Permaculture Principles, Twelve principles for twelve months, web of connections by emilycrofton. Bookmark the permalink.